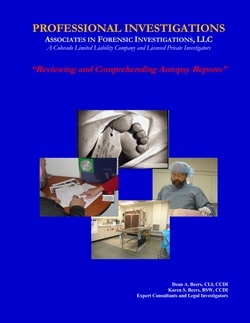 This 20+ page white paper details understanding the value of the autopsy report and the information accompanying it is a valuable asset to all investigators. This was originally Dean's Certified Legal Investigator examination white paper for the National Association of Legal Investigators (NALI). Voltaire said “To the living we owe respect, but to the dead we owe only the truth.” This is the definitive task of the medicolegal death investigator and forensic pathologist. The course of the death investigation has multiple phases including: scene investigation, body assessment, medical records, and the forensic autopsy. This is finalized in three documents: the death certificate, the investigator’s report, and the autopsy report. In order to understand the importance of the autopsy report, and how to interpret it, you should understand how all the other factors influence the report and why you cannot rely on the autopsy report alone. This is a must have reference for all investigators involved in death and injury causation.